Every year the Pantone Color Institute (known to define Colours of the Year) evaluates the colors shown by fashion designers at the New York Fashion Week. This information is used to create The Pantone Color of the Year and the Pantone Fashion Color Report with the top 10 fashion colors for the comming season. Rural and rustic isn’t the only way to do yellow. If you’ve gone for the recent grey trend then injecting a shot of daffodil yellow will take your scheme from spring into Summer and add an exciting edge. FROM Amy Adams, to Millie Bobby Brown and Ruth Negga, Hollywood’s biggest names took to the red carpet in Los Angeles for the Golden Globes. While Stone herself wore a romantic tulle dress by Maison Valentino for the evening (a mood that Felicity Jones, in Gucci, Nicole Kidman, in a frothy Alexander McQueen gown, and Hailee Steinfeld in Vera Wang also followed), daffodil yellow was the colour of the evening, with Emily Ratajkowski, Reese Witherspoon, Maisie Williams, Kerry Washington and Natalie Portman (in Prada) opting for an array of buttery shades. British actress, Clare Foy, collected the award for Best Actress (TV) for her starring role in The Crown (the Netflix series also won Best TV Series) in a dazzling Erdem number. She wasn’t alone in sporting show-stopping sequins fit for a modern-day screen siren. Loving star Ruth Negga picked a similarly shimmering style by Louis Vuitton, while Amy Adams glittered in Tom Ford. Pale shades are redefining bold style as summer departs, so infuse your wardrobe with soft combinations of grey and yellow to pull off a distinctly post retro look. If you’re looking for an alternative to the over-the-top detailing on many of the handbag lines on the high street, then drop bags are it. Their simplistic shape and minimalistic design is the new definition of refined chic. Daffodil Scarf A light and airy design crafted in silky polyester. Features a modern take on the timeless leopard print in a trendy, summery colour palette dominated by soft yellow and grey. Size: 180 x 105 cm. Daffodil Necklace This exquisite statement necklace is like wearing a burst of sunshine around your neck! 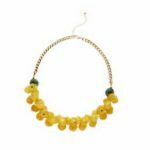 Features a chunky arrangement of vibrant yellow and grey acrylic beads, each precision faceted to dazzle in the light. Finished with a golden-plated curb chain. Nickel safe. Length: 45 cm + 6 cm extension.